Explain current thinking regarding pediatric postoperative pain management techniques. List drugs and drug combinations that are useful for postprocedural pain management in pediatric patients, as well as precautions and contraindications. Describe clinical strategies for prescribing postoperative medications and ways to help parents and caregivers manage the child’s pain. Most of the review articles on postoperative pain management in dentistry were written nearly a decade or more ago, especially those geared toward pediatric patients.1–3 Postoperative pain management is undergoing dramatic changes in response to the opioid epidemic,4 and current thinking is that each patient should have an individualized pain management plan. Due to misconceptions about how children experience pain, fear of adverse side effects, inadequate physician prescriptions, and incorrect dosing by parents, pain management in pediatric dentistry has been suboptimal.5,6 Many clinicians issue postoperative instructions almost as an afterthought, and the standard recommendation is to give the child an over-the-counter (OTC) pain medication, if needed. However, recent research has shown pediatric patients may not have adequate pain relief at home unless time is taken to educate parents and caregivers.7 This article will discuss how to effectively manage postoperative pain in children, and review the efficacy and safety of the available drugs. Distraction is the most powerful tool used to guide children’s attention away from painful experiences during procedures. Passive distraction — such as listening to music, reading a book or video games — has been shown to be a powerful adjunct to pain management.13 Dentists may remind parents/caregivers that these types of activities can be helpful during the postoperative period. Clinicians can offer several options for mitigating postoperative pain. The first is preemptive analgesia. While available evidence is low due to the limited number of studies in pediatric dentistry, two papers have shown preemptive analgesia can reduce the intensity of postoperative pain following an extraction.14,15 For pediatric patients, parents/caregivers could be advised to give their child a dose of OTC pain medication prior to the appointment. Table 1 reviews the common medications and dosages used for analgesia in pediatric dentistry. Ibuprofen is the first-line treatment for mild-to-moderate postoperative pain because it offers advantages over the most common pediatric pain medicine, acetaminophen. First, it is an anti-inflammatory (and most dental pain has an inflammatory component), and second, it has a longer therapeutic window, lasting six hours. Although ibuprofen is safe and effective for the majority of patients, it is not recommended for some children, including those with bleeding disorders, liver dysfunction, renal conditions, gastric irritation, or asthma. For children in whom ibuprofen is contraindicated, acetaminophen is generally advised. A safe and effective measure for controlling mild-to-moderate postoperative pain is the combined use of ibuprofen and acetaminophen.19 In fact, this grouping has been shown to be as effective as three opioid (hydrocodone/oxycodone/codeine) and acetaminophen combination analgesics.20 Alternating ibuprofen and acetaminophen every three hours has also been shown to be efficacious for short periods due to their differing mechanisms of action. A study of tonsillectomy patients showed only 9.6% reported inadequate pain control from an alternating schedule.21 The disadvantage is the frequency of dosing necessary to prevent breakthrough pain. Clinicians must consider if the patient’s social situation or health literacy will allow compliance with such a frequent dosing schedule.22 If children are likely to only receive a dose or two of pain medication at home, a single medication therapy — such as naproxen — may be better than an alternating one. In the rare case that an OTC analgesic therapy is insufficient, opioids are the next best choice. Historically, codeine, hydrocodone, oxycodone, and tramadol, either alone or in combination with acetaminophen, have been used for pain control. However, recent evidence has brought the use of these medications in children under scrutiny. The underlying concern is the variability of drug metabolism in the general population. Cytochrome P450 2D6 (CYP2D6) is a liver enzyme that is responsible for metabolizing many drugs, including codeine and hydrocodone. Activity of CYP2D6 varies significantly as a function of genetic polymorphisms. One in 50 people have multiple copies of the CYP2D6 gene, and therefore greater-than-normal CYP2D6 function.23 Ultra-rapid metabolizers will convert a “normal” dose of codeine to high levels of morphine very quickly, which can lead to potentially fatal respiratory depression.24 By comparison, 10% to 30% of patients are “non-metabolizers” or “poor-metabolizers” of drugs, and may experience inadequate pain control. Due to concern with opioids in the pediatric population, best clinical practices are still being developed. If ibuprofen does not adequately control pain, the second management strategy would be to alternate ibuprofen with acetaminophen or use them in combination. The American Academy of Pediatric Dentistry notes that use of codeine and its alternatives (oxycodone, hydrocodone, morphine and tramadol) as analgesics for children under 12 is not recommended.18 However, in rare cases — such as OTC therapy being insufficient or if one of the OTC medications is contraindicated due to a medical condition — opioids can be used, albeit with caution due to their untoward effects of sedation and respiratory depression.27 Of the traditional opioids, oxycodone may be the safest choice, and this decision can be made in consultation with the child’s pediatrician or primary care physician. Generally, in this scenario, limited doses of opioids are prescribed for breakthrough pain. 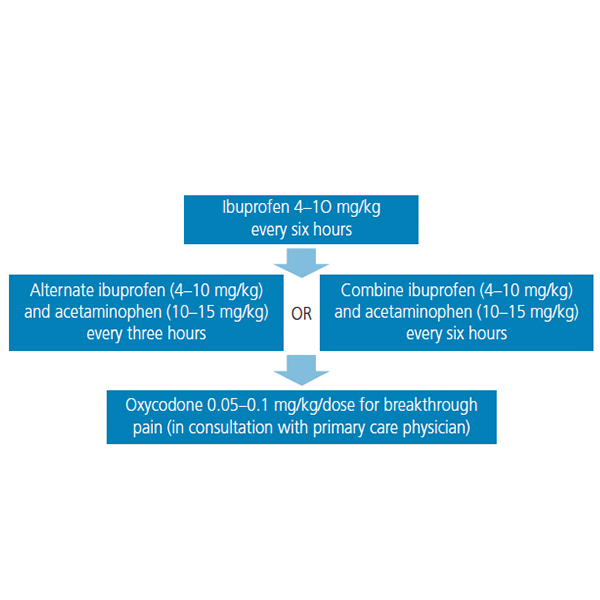 Thus, the patient is taking a nonopioid drug (ibuprofen or acetaminophen), and a “rescue” dose of opioid is given only if pain is not managed by the nonopioid analgesic. In this case, only three to four doses of opioid are prescribed. Oxycodone is generally recommended in healthy children at 0.05 to 0.1 mg/kg every three to four hours for breakthrough pain. If the patient is already using acetaminophen, oxycodone without the addition of acetaminophen is available as an oral solution at 5 mg/5 ml. If the child did not receive a preemptive dose of analgesia prior to the appointment, the patient could receive a dose at the end of the procedure. This postprocedural administration would not only allow an analgesic to take effect while the child is still numb, it would also give the provider an opportunity to offer medication-administration education. FIGURE 1. Analgesics should be administered around the clock for the first 36–48 hours. For many children, research has shown that PRN (“as needed”) means “not given.”4 The recommendation for managing moderate postoperative pain is to create stable plasma levels of analgesics and decrease the chance of breakthrough pain by administering analgesics around the clock (ATC) for the first 36 to 48 hours.3,12 (Figure 1 offers a stepwise pain management overview.) The rise of mobile technology has created new avenues for providing support for health behaviors, including medication administration. Multiple applications exist that can help remind parents/caregivers which medications to give (if alternating between ibuprofen and acetaminophen) and when to give them. Mobile applications can improve ATC compliance.36 Educating parents/caregivers that such applications exist may provide a simple, useful tool to help manage their child’s postoperative pain. While not every patient will experience postoperative pain from dental procedures, effective pain management provides physical and psychological benefits to the child. Given that opioid use should be rare in this patient population, seeking expert consultation is prudent. Understanding the risks and benefits of various analgesics and combinations of drugs, using preemptive analgesia, and employing ATC dosing can prevent or substantially relieve postoperative pediatric dental pain. Tate AR, Acs G. Dental postoperative pain management in children. Dent Clin North Am. 2002;46:707–717. Haas DA. An update on analgesics for the management of acute postoperative dental pain. J Can Dent Assoc. 2002;68:476–482. Becker DE. Pain management: part 1: managing acute and postoperative dental pain. Anesth Prog. 2010;57:67–78; quiz 79–80. Shaefer J, Barreveld AM, Arnstein P, Kulich RJ. Interprofessional education for the dentist in managing acute and chronic pain. Dent Clin North Am. 2016;60:825–842. Dineen KK, DuBois JM. Between a rock and a hard place: can physicians prescribe opioids to treat pain adequately while avoiding legal sanction? Am J Law Med. 2016;42:7–52. Crouch BI, Caravati EM, Moltz E. Tenfold therapeutic dosing errors in young children reported to US poison control centers. Am J Health Syst Pharm. 2009;66:1292–1296. Fortier MA, MacLaren JE, Martin SR, Perret-Karimi D, Kain ZN. Pediatric pain after ambulatory surgery: where’s the medication? Pediatrics. 2009;124:e588–e595. Staman NM, Townsend JA, Hagan JL. Observational study: discomfort following dental procedures for children. Pediatr Dent. 2013;35:52–54. Brown JM, O’Keeffe J, Sanders SH, Baker B. Developmental changes in children’s cognition to stressful and painful situations. J Pediatr Psychol. 1986;11:343–357. Acs G, Drazner E. The incidence of postoperative pain and analgesic usage in children. ASDC J Dent Child. 1992;59:48–52. Ashley PF, Parekh S, Moles DR, Anand P, MacDonald LC. Preoperative analgesics for additional pain relief in children and adolescents having dental treatment. Cochrane Database Syst Rev. 2016;8:CD008392. Needleman HL, Harpavat S, Wu S, Allred EN, Berde C. Postoperative pain and other sequelae of dental rehabilitations performed on children under general anesthesia. Pediatr Dent. 2008;30:111–121. Srouji R, Ratnapalan S, Schneeweiss S. Pain in children: assessment and nonpharmacological management. Int J Pediatr. 2010;2010: 474838. Aznar-Arasa L, Harutunian K, Figueiredo R, Valmaseda-Castellón E, Gay-Escoda C. Effect of preoperative ibuprofen on pain and swelling after lower third molar removal: a randomized controlled trial. Int J Oral Maxillofac Surg. 2012;41:1005–1009. Baygin O, Tuzuner T, Isik B, Kusgoz A, Tanriver M. Comparison of pre-emptive ibuprofen, paracetamol, and placebo administration in reducing post-operative pain in primary tooth extraction. Int J Paediatr Dent. 2011;21:306–313. Eccleston C, Cooper TE, Fisher E, Anderson B, Wilkinson NM. Non-steroidal anti-inflammatory drugs (NSAIDs) for chronic non-cancer pain in children and adolescents. Cochrane Database Syst Rev. 2017;8:CD012537. Useful medications for oral conditions. Pediatr Dent. 2017;39:492–498. Ong CK, Seymour RA, Lirk P, Merry AF. Combining paracetamol (acetaminophen) with nonsteroidal antiinflammatory drugs: a qualitative systematic review of analgesic efficacy for acute postoperative pain. Anesth Analg. 2010;110:1170–1179. Chang AK, Bijur PE, Esses D, Barnaby DP, Baer J. Effect of a single dose of oral opioid and nonopioid analgesics on acute extremity pain in the emergency department: a randomized clinical trial. JAMA. 2017;318:1661–1667. Liu C, Ulualp SO. Outcomes of an alternating ibuprofen and acetaminophen regimen for pain relief after tonsillectomy in children. Ann Otol Rhinol Laryngol. 2015;124:777–781. Freedman RB, Jones SK, Lin A, Robin AL, Muir KW. Influence of parental health literacy and dosing responsibility on pediatric glaucoma medication adherence. Arch Ophthalmol. 2012;130:306–311. Tobias JD, Green TP, Cote CJ. Section On Anesthesiology and Pain on Medicine, Committee On Drugs. Codeine: time to say “no”. Pediatrics. 2016;138:pii:e20162396. Voronov P, Przybylo HJ, Jagannathan N. Apnea in a child after oral codeine: a genetic variant – an ultra-rapid metabolizer. Paediatr Anaesth. 2007;17:684-687. US Food and Drug Administration Center for Drug Evaluation and Research. Joint Meeting of the Pulmonary-Allergy Drugs and Drug Safety and Risk Management Advisory Committee Meeting (PADAC) and the Frug Safety and Risk Managment Advisory Committee (DSaRM). Available at: https://www.fda.gov/downloads/AdvisoryCommittees/CommitteesMeetingMaterials/Drugs/Pulmonary-AllergyDrugsAdvisoryCommittee/UCM487401.pdf. Accessed October 4, 2018. US Food and Drug Administration. FDA Drug Safety Communication: FDA restricts use of prescription codeine pain and cough medicines and tramadol pain medicines in children; recommends against use in breastfeeding women. Available at: https://www.fda.gov/Drugs/DrugSafety/ucm549679.htm. Accessed October 4, 2018. Council on Clinical Affairs. Best Practices for Pain Management in Infants, Children, Adolescents, and Individuals with Special Healthcare Needs. Available at: http://www.aapd.org/media/Policies_Guidelines/BP_Pain.pdf. Accessed October 4, 2018. Kokki H, Rasanen I, Reinikainen M, Suhonen P, Vanamo K, Ojanpera I. Pharmacokinetics of oxycodone after intravenous, buccal, intramuscular and gastric administration in children. Clin Pharmacokinet. 2004;43:613–622. Tobias JD. Codeine: Time To Say “No”RE: Dr. Dansky’s comments. Available at: http://pediatrics.aappublications.org/content/early/2016/09/15/peds.2016-2396.comments#re-dr-danskys-comments. Accessed October 4, 2018. Allareddy V, Rampa S, Allareddy V. Opioid abuse in children: an emerging public health crisis in the United States! Pediatr Res. 2017;82:562–563. McCabe SE, West BT, Veliz P, McCabe VV, Stoddard SA, Boyd CJ. Trends in medical and nonmedical use of prescription opioids among US adolescents: 1976–2015. Pediatrics. 2017;139:pii:e20162387. National Institute on Drug Abuse. Principles of Adolescent Substance Use Disorder Treatment: A Research-Based Guide. Available at: https://www.drugabuse.gov/publications/principles-adolescent-substance-use-disorder-treatment-research-based-guide/principles-adolescent-substance-use-disorder-treatment. Accessed October 4, 2018. Tanner S, Wells M, Scarbecz M, McCann BW, Sr. Parents’ understanding of and accuracy in using measuring devices to administer liquid oral pain medication. J Am Dent Assoc. 2014;145:141–149. Yin HS, Parker RM, Sanders LM, et al. Liquid medication errors and dosing tools: a randomized controlled experiment. Pediatrics. 2016;138:e20160357. Yin HS, Parker RM, Sanders LM, et al. Pictograms, units and dosing tools, and parent medication errors: a randomized study. Pediatrics. 2017;140:pii:e20163237. Bailey SC, Belter LT, Pandit AU, Carpenter DM, Carlos E, Wolf MS. The availability, functionality, and quality of mobile applications supporting medication self-management. J Am Med Inform Assoc. 2014;21:542–546. From Decisions in Dentistry. November 2018;4(11):32,35–37. Jennifer A. Fernandez, DMD, MS, MDS, is an assistant professor of pediatric dentistry at the University of Tennessee Health Science Center in Memphis. A diplomate of the American Board of Pediatric Dentistry, she also maintains a private practice in Memphis. Martha H. Wells, DMD, MS, is an associate professor and program director of pediatric dentistry at the University of Tennessee Health Science Center in Memphis. She serves as a board examiner for the American Board of Pediatric Dentistry, and is one of the editors of the 6th edition of Pediatric Dentistry, Infancy Through Adolescence. She can be reached at mwells@uthsc.edu.